The Nigerian Goat is the only true miniature goat breed of dairy type and character. A Nigerian's conformation is similar to that of the larger dairy goat breeds. The parts of the body are balanced in proportion to their size. The nose is straight, although there may be a small break or stop at the level of the eyes. The ears are upright. The coat is soft with short to medium hair. Any color or combination of colors is acceptable. The ideal height of Nigerian goats is 17" to 19" for does and up to 21" is allowed in the breed standard. 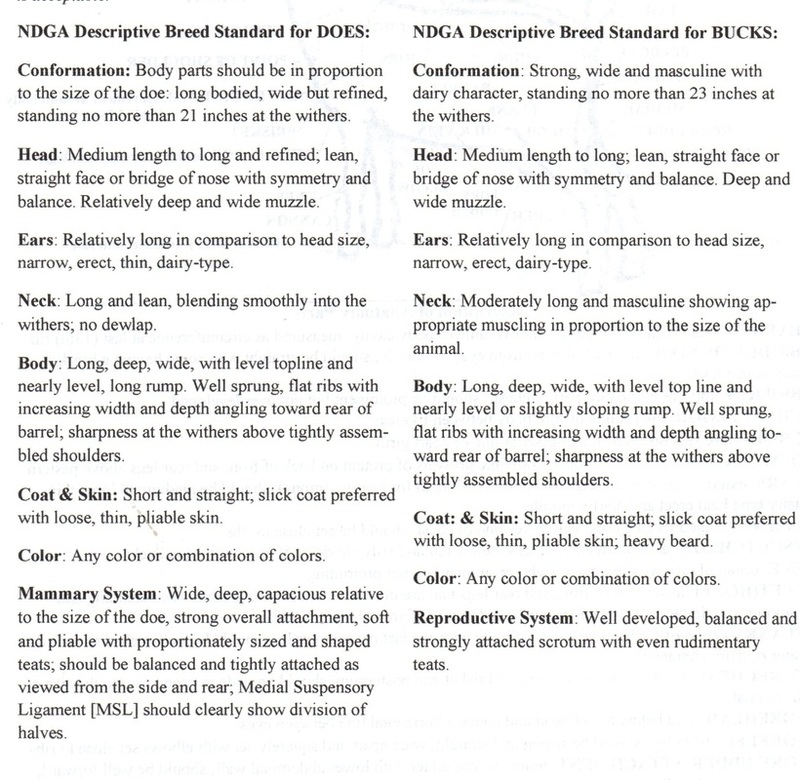 Ideal height for bucks is 19" to 21" with up to 23" allowed in the breed standard. Ideal weight is suggested to be about 75 +- lbs. Animals are disqualified from the show ring for being over-sized and/or for other faults such as: having a curly coat, roman nose, pendulous ears or evidence of myatonia (a breed characteristic of fainting goats).